Janis Keyser is a teacher, parent educator, program director, and speaker specializing in early childhood and family development. She teaches in the early childhood education department at Cabrillo College in Aptos, California, and has been conducting workshops for parents and teachers for more than thirty-five years. Janis earned a Master's degree in human development from Pacific Oaks College and is a certified trainer in the WestEd Program for Infant/Toddler Caregivers. She is the author of From Parents to Partners: Building a Family-Centered Early Childhood Program, published by Redleaf Press, and the coauthor of Becoming the Parent You Want to Be: A Sourcebook of Strategies for the First Five Years. Janis has also developed two sets of parenting and teaching videos on communication and positive discipline for two- to five-year-olds and for school-age children. Read a review of this book. 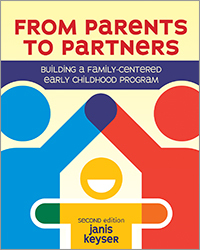 Partnering with parents is essential if your early childhood program is to succeed. 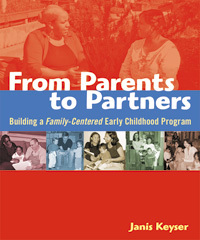 From Parents to Partners explores the reasons and methods for developing ongoing partnerships with parents and other family members. It also provides the tools and strategies you need to build the communication and support networks within which these partnerships thrive. Throughout the book are interactive, hands-on exercises to help you adapt these principles to your individual beliefs, practices, and experiences. Newsletters, bulletin boards, and parent conferences are only some of the practical tools you can use to involve parents in their child's care and education. This innovative, center-tested approach is designed to include the whole family unitnot just the parentsin the partnership. Softbound, 169 pgs. Build collaborative partnerships with families to help everyone thrive. This book explores the reasons and methods for developing cooperative partnerships, along with tools and strategies to help build the support network for family-centered care. This book offers a theoretical background on why it is important to talk with families and how to efficiently and effectively communicate observations and reflections. It also includes a new chapter on Reggio-inspired care. Overcome common challenges and create more avenues to include families in your program.